Cirrhosis of the liver is a progressive and chronic illness which eventually ends up with total liver failure. Normal liver cells are damaged by the process of inflammation and they are replaced with nonfunctional scar tissue. This way the liver loses its ability to perform majority of essential functions for the body. It is estimated that the liver participates in around 400 different processes important for the human body. Storing blood and nutrients, removal of certain toxic substances, manufacturing and secreting bile are only some of them. End stage liver cirrhosis affects many organs and may cause serious multiple organ failure. Ascites is one of many characteristics of end stage liver cirrhosis and the one that may also occur even in earlier stages of liver cirrhosis. It represents accumulation of fluid inside the peritoneum. The reason why ascites forms is that the liver cannot longer synthesize albumin (a protein). Lack of albumin leads to accumulation of fluid inside the body. The excess fluid leaves blood vessels and starts to collect in different cavities. One of them is abdominal cavity. Apart from accumulation of excess fluid in the peritoneum, it can also affect the pleural cavity (pleural effusion) and the pericardium (pericardial effusion). There is one more contributing factor to formation of ascites. Namely, pressure inside the portal vein in patients suffering from liver cirrhosis eventually starts to rise. The portal vein is a major blood vessel which collects the blood from all the digestive system organs. Once ascites forms the pressure inside this vein starts to fall and this triggers the renin-angiotensin system. This system forces the kidneys to stop excreting sodium and this prevents further elimination of fluids from the body resulting in even greater elevation of blood pressure and subsequent increased accumulation of fluid inside the peritoneal cavity. Since in end stage liver cirrhosis the organ loses its ability to neutralize certain toxic substances these accumulate in the body and may have negative effects on many organs. Toxins have huge impact on the brain and brain function. Their accumulation in the central nervous system lead to confusion, stupor, seizures, coma and death. 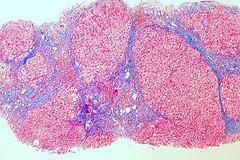 This complication of end stage liver cirrhosis is known as hepatic encephalopathy. Inadequate function of the liver in terminal stage of cirrhosis leads to improper synthesis of certain factors of coagulation and the body also lacks vitamin K because of inadequate bile production which is essential for absorption of this vitamin. The previously mentioned affects blood clotting and patients become prone to bruising and bleeding. One of common complications in end stage liver cirrhosis is bleeding from esophageal varices. This complication results from clotting disorders and portal hypertension. Bleeding from dilated esophageal veins can be severe and sometimes even life-threatening. Renal failure in end stage liver cirrhosis develops as a consequence of all other imbalances in the body, particularly low blood pressure. It is severe and can even make all the current problems even worse. And finally, respiratory insufficiency usually occurs due to serious accumulation of fluid inside the pleural cavity. This way the excess of fluid does not allow the lungs to expand properly and one suffers from severe difficulty breathing. How long can someone live with liver cirrhosis? My husband has hepatocellorcarcinoma, can it give him pain in legs?